If you are ready to take control of your transportation options. Get a free 20-minute phone consultation. Call 619.742.3368. If you are a 55+ community or independent living campus request a one-hour free Savvy, Safe, Seventy+, and Behind The Wheel on site talk. Ask me about my 3-hour workshop for experienced drivers. If you are an Aging Life Care Expert, Discharge Planner, or Social Worker we’re the information and referral service you are looking for. 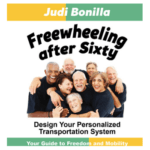 Freewheeling is the reference guide to resources and programs. Insurance Agencies, Financial, and Estate Planners the well-being of your clients is top of mind. Include this book as part of retirement planning services.